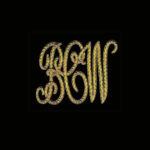 The original Bowhill & Elliott monogrammed slippers. 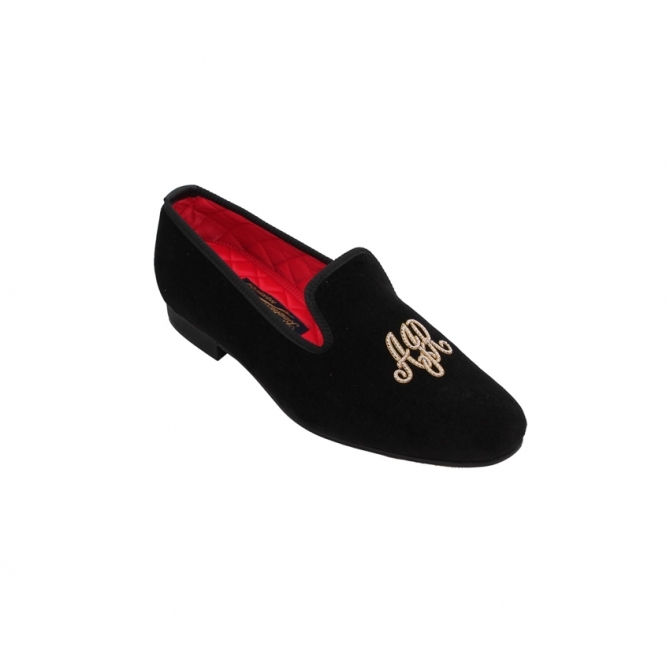 These monogrammed velvet shoe slippers are made to order, and you may choose from a range of 9 velvet colours and 7 silk quilt lining colours. Looking for something different? 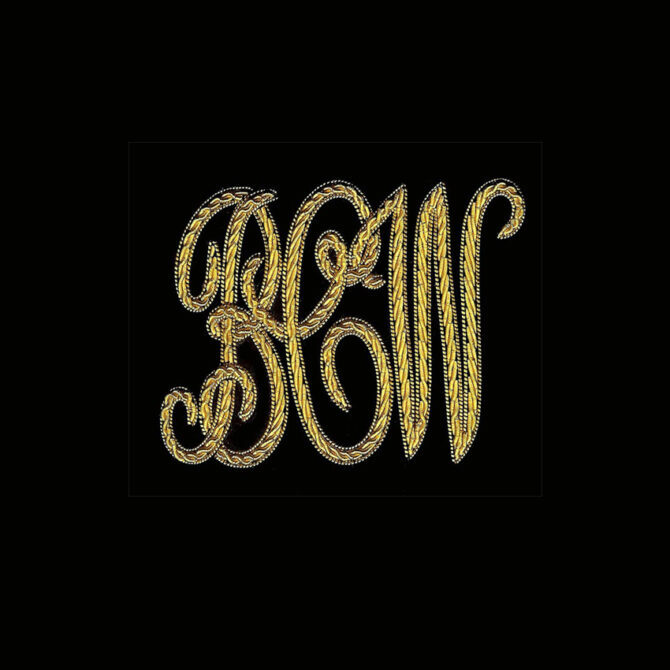 Read below for more information on our custom designed embroidery service, or email shop@bowhillandelliott.co.uk with your own design ideas. As these are made to order, please ALLOW 6 WEEKS FOR DELIVERY. We offer black velvet; navy velvet; brown velvet; aqua velvet; green velvet; olive velvet; red velvet; wine velvet and regal velvet slippers. You may choose from two embroidery styles, or perhaps you’d like to get in touch at shop@bowhillandelliott.co.uk with your own custom albert slippers design. We can – and have – embroidered a huge range of crests, badges, emblems, logos, military insignia – as far as your imagination will stretch. Take some inspiration from some of the other items in our shop, like the stag slippers, skull slippers. The traditional albert slippers are sometimes referred to as churchill slippers; we were asked to make a pair for The Darkest Hour film, for Gary Oldman’s Winston Churchill character. See the finished pair here. These designer mens slippers are handmade in England from our original Norwich factory. They are finished with a leather sole. This sole is suggested for indoor use, although many of our customers use them as as outdoor slippers, but if you are looking for an outdoor slipper style shoe or velvet loafers, again, please give us a call on +44 1603 620116 or email shop@bowhillandelliott.co.uk asking for our Street Slipper ®. 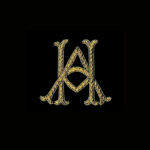 As these are bespoke handmade shoes in their embroidery, with a made to order, traditionally employing the hand lasting technique, please ALLOW 6 WEEKS FOR DELIVERY. You may choose from two embroidery styles, or perhaps you'd like to get in touch at shop@bowhillandelliott.co.uk with your own custom albert slippers design. We can - and have - embroidered a huge range of crests, badges, emblems, logos, military insignia - as far as your imagination will stretch. Take some inspiration from some of the other items in our shop, like the stag slippers, skull slippers. The traditional albert slippers are sometimes referred to as churchill slippers; we were asked to make a pair for The Darkest Hour film, for Gary Oldman's Winston Churchill character. See the finished pair here.